The races for 21 city council and mayoral seats up for election this November in Humboldt County are coming into view this week as Eureka ushers in a new true ward era and Arcata residents prepare to decide the fate of the city's most controversial figure. As the Journal was going to press on Tuesday night, Blue Lake, Fortuna, Rio Dell and Ferndale were accepting nomination papers until Aug. 15 for at least some of their open seats after incumbents did not seek reelection. For the final lineup, visit the Journal's website at www.northcoastjournal.com later this week. In Arcata, incumbents Sofia Pereira, who is currently serving as mayor, and Brett Watson, vice mayor, will vie for two open seats on the council with candidate Valerie Rose-Campbell, who previously made a run for the dais in 2016. The three-way race comes amid a backdrop of sometimes contentious council meetings over the statue of President William McKinley — which has stood center stage in the plaza for more than 100 years — and a proposed large-scale, student housing project called The Village that has drawn concerns about traffic, noise and impacts to nearby neighborhoods. Both Watson, who was appointed to his seat in April of 2017 after former Councilmember Mark Wheetley stepped down to take the city manager's post in Fortuna, and Pereira, first elected in 2014, voted with the council majority in February to remove McKinley. But the bronze work by renowned Armenian sculptor Haig Patigian that survived the 1906 San Francisco earthquake to be dedicated to Arcata by a local farmer at a Fourth of July celebration has been resurrected, at least for the moment, via Measure M — a citizen ballot initiative that will put the statue's future to the city's voters. The arguments submitted for and against the measure — along with the respective rebuttals — reflected much of the passionate and sometime terse — debate about whether the tribute to the nation's 25th president is a symbol of repression whose time has come or an important part of the city's history that should be preserved. Over in Eureka, a crowded field of 12 candidates will grace the ballot as residents cast votes under the true ward system for the first time since the late 1920s. 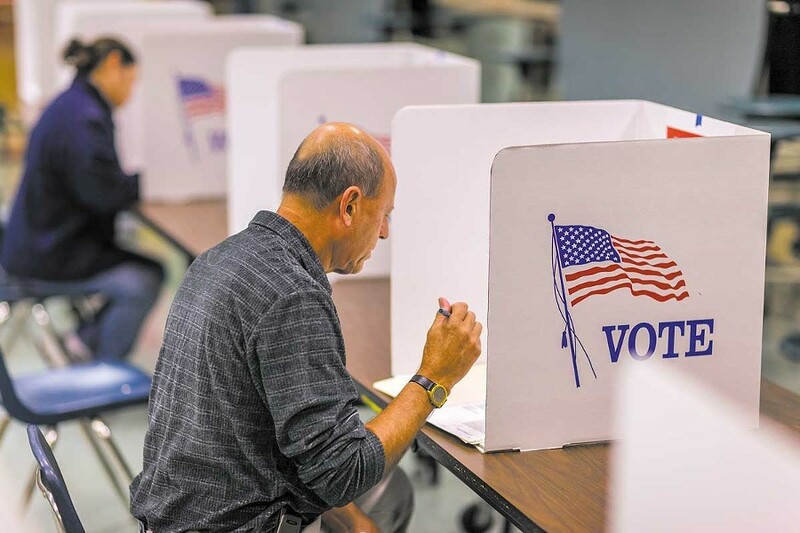 Instead of council members being elected in a citywide vote, representatives of the city's five wards will now be chosen solely by registered voters within the individual district boundaries. Eureka residents approved the move back in November of 2016, prompting the first rejiggering of the wards in 40 years to ensure each one has a roughly equal number of residents. That's resulted in a bit of shuffle for incumbents Heidi Messner, Natalie Arroyo and Kim Bergel, who now reside in different wards than the ones they were elected to represent. Three council seats — Ward 1, 3 and 5 — and the separately elected mayor's post are up for grabs in Humboldt County. Because Councilmember Marian Brady and Mayor Frank Jager are termed out, the filing period for the November election was not extended in Eureka. Among those running for mayor are Messner, who was appointed to the seat in 2016 when what appeared up to the last minute to be a three-person race became a solo run after two other candidates dropped out. Now she's facing Susan Seaman, program director of the Arcata Economic Development Corporation, and Take Back Eureka founder Michelle Costantine for the primarily ceremonial post. If Messner wins, she will be able to nominate a person to fill her Ward 2 seat (she now lives in Ward 5 but her current term runs until 2020) with council approval, which has been a trend set in recent years by Jager and now Supervisor Virginia Bass. With Brady termed out of office, Ward 1 has a crop of four new hopefuls looking to take the seat: Caroline Brooks, co-owner of Caroline's TX BBQ and Johnson Auto Electric; Anthony Mantova, owner of Mantova's Two Street Music; Leslie Castelano, founder and artistic director of Synapsis; and Hailey Lamb, who works at Coast Central Credit Union. The Ward 3 race includes Arroyo (who was elected in Ward 5), who works as a senior planner for a nonprofit and is an enlisted member of the U.S. Coast Guard Reserve; Jeannie Breslin, who has a background in public relations and marketing and launched an "I Like Eureka" campaign; and John Fullerton, a certified public accountant who ran unsuccessfully in 2016. Things are a bit quieter over in Ward 5 where Bergel, who is switching over from Ward 3, is running against Joe Bonino, vice chair of the city's Planning Commission who previously ran for a council seat in 2012. Blue Lake has two candidates for two seats — Elaine Hogan and Christopher Curran — but the filing period remains open with Councilmember Elizabeth Mackay choosing not to seek another term. The other seat is currently vacant. A similar story was at play in Ferndale, where the race was still being set as the Journal went to print. Elementary school teacher Jennifer Fisk-Becker, who was previously appointed to fill a vacant council seat in June, marking the first woman to sit at that city's dais in 15 years — is unopposed for a two-year term. So far, Councilmember Michael Sweeney has put in his name for mayor while Stephen Avis and Robin Smith are vying for a four-year seat, but the filing period was extended because current Mayor Don Hindley and Councilmember Doug Brower did not seek reelection and Sweeney is looking to serve as mayor. Fortuna was also having an extended nomination period with two of the incumbents — Tiara Brown and Doug Strehl — not going for another term, but the contenders to date include incumbent Sue Long, Mike Johnson and Jeremy Stanfield. Ditto for Rio Dell, where incumbent Debra Garnes is running again but fellow councilmembers Tim Marks and Gordon Johnson are not. Also, putting their hats in the ring are Bryan Richter, Julie Woodall and John McManus, although McManus' signatures were still being verified on Monday. Up in the northern reaches of Humboldt County, Trinidad has a full slate of candidates — not a small feat in a city of less than 400 — with six candidates vying for the council, including incumbents Susan Rotwein, Jim Baker and Dwight Miller along with business owner Mike Morgan, teacher Tom Davies and Brett Gregory, who previously served on the planning commission. The election takes place on Nov. 6.